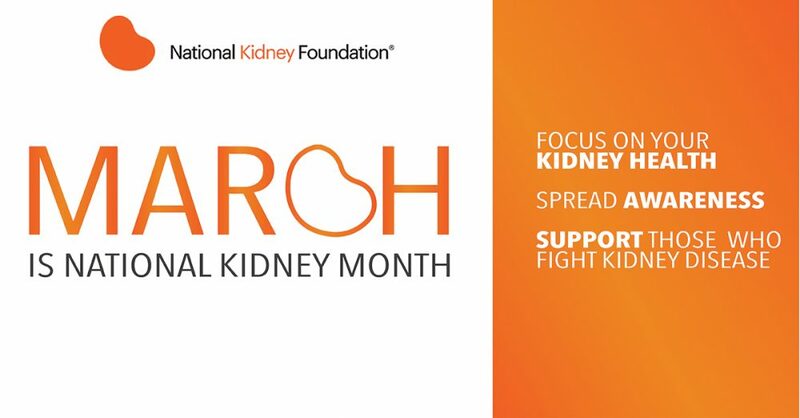 New York, NY—March 9, 2017—The National Kidney Foundation (NKF) is encouraging all Americans to “Heart Your Kidneys” (#heartyourkidneys) today on World Kidney Day, and throughout the month of March, National Kidney Month. The new public awareness campaign seeks to lift the kidneys to the status of other, better-understood, vital organs like the heart so that people understand what kidneys do and why they are vital to sustaining life. “When it comes to vital organs, hearts get all the love. Kidneys get the short end of the stick,” said Kevin Longino, CEO, National Kidney Foundation. “But kidneys are essential to keeping you healthy—when your kidneys stop working, so do you. Trust me, I know,” added Longino, who received a kidney transplant 12 years ago. More than 26 million Americans have kidney disease, and most don’t even know they have it. When kidneys fail, dialysis or a transplant is needed just to stay alive. One in three American adults is at risk for developing the disease within their lifetimes. National Kidney Foundation, founded in 1950 by a mother desperate to find a cure for her infant son, is now the nation’s leading kidney advocacy organization and recognized throughout the world for improving the diagnosis and treatment of kidney disease. The foundation’s new “Heart Your Kidneys” campaign seeks to use fresh, edgy messaging to encourage Americans to take kidney disease seriously. One of the tactics to bring NKF’s new awareness campaign into culture is through high-tech tattoos, designed by researchers at Northwestern University. At South by Southwest (SXSW), the annual conglomerate of film, interactive media and musical festivals taking place in Austin, TX, NKF will unveil a new “tech tattoo” to measure hydration status in the body. For people with kidney disease, exercise and proper hydration are essential to helping preserve kidney function. A device that can monitor hydration status can help ensure effective kidney protection. The tech tattoo is a first-of-its-kind, soft, flexible microfluidic device that easily adheres to the skin and measures the wearer’s change in hydration level in response to exercise. A little larger than a quarter and about the same thickness, the simple, low-cost device analyzes key biomarkers to help a person decide quickly if any adjustments, such as drinking more water or replenishing electrolytes, need to be made or if something if medically awry. The tattoo features the Heart Your Kidneys branding. Another high-tech feature the foundation is rolling out at SXSW is a co-branded water bottle that uses a sensor to record how many ounces of water is consumed. The Hidrate Spark 2.0, using a connected hydration app, suggests your daily water goal based on your physiology and environment, and gives a glowing reminder to hydrate. It also syncs to Fitbit, Apple Watch, and more. For the month of March, a special “Heart Your Kidneys” water bottle will be available for sale, with 10% of all proceeds benefitting National Kidney Foundation. In addition, another fresh piece of the Heart Your Kidneys campaign will unveil in New York City on World Kidney Day, March 9th at “Tattooed New York”, an exhibit at The New York Historical Society Museum and Library. Special permanent Heart Your Kidneys tattoos will be on display at a live event from 12:30 to 4:30 PM, EST and free limited edition flash tattoos, designed by celebrity tattoo artist Tommy Helms, will be distributed. Finally, local icons and buildings nationwide are turning orange on March 9th to commemorate World Kidney Day and bring awareness to the disease, including The Empire State building, NYC; LAX Airport pylons; The Peace Bridge, Niagara Falls, NY; Zakim Bridge and South Station, Boston, MA; Ben Franklin Bridge, Lits Building, Two Liberty Place, PECO Building, Philadelphia, PA; The Seattle Great Wheel, Seattle, WA; The Falls, Sioux Falls, SD; Odell Plaza and Duke Energy Center, Charlotte, NC; Gulf Tower and The Fence at Carnegie Mellon University, Pittsburgh, PA; Enger Tower, Duluth, MN; Lowery Avenue Bridge and 35W Bridge, Minneapolis, MN; Korean War Veterans Memorial Bridge and Metro Courthouse, Nashville, TN; Burns Bridge, Worcester, MA; Kansas City Power and Light Building and Marriott Hotel, Kansas City, MO; The Planetarium at The St. Louis Science Center, St. Louis, MO; Radisson Hotel Cincinnati Riverfront, Cincinnati, OH; Gulf Tower, Alleghany County Courthouse, Highmark Building and One Oxford Center, Pittsburgh, PA. The foundation’s new campaign logo, tech tattoos, flash sheet for permanent tattoos, Hidrate Spark 2.0 water bottles and awareness information can be found at heartyourkidneys.com. Join the conversation #heartyourkidneys. This campaign was created through generous pro bono agency assistance from WPP firms Berlin Cameron, Y&R and Cohn and Wolfe.